After a very successful 2018, Active Re closes the year with wonderful news. Capital Finance International has granted the company with the award “Best Credit Reinsurance Solutions for Institutions-Latin America”. Capital Finance International is “a print journal and online resource reporting on business, economics and finance, recognizes that the traditional distinction between emerging and developed markets is now far less meaningful as world economies converge. Headquartered in London, the world’s most multicultural city, CFI.co brings you coverage and analysis of the drivers behind change. Combining the views of leading multilateral and national organizations with thought leadership from some of the world’s top minds, our dedicated editorial team ensure that readers better understand the forces influencing and reshaping the global economy.” (taken from www.cfi.co). The following profile for Active Re will be published on both print and online issues of the journal this coming January 2019. Active Capital Reinsurance Ltd. (Active Re) operates on a principle of “benefits for all”. During its 11-year trajectory, the company has firmly established itself as one of the leading providers of credit-related reinsurance solutions in Latin America. Headquartered in Barbados, the company has offices in Panama and Miami, FL (USA) that are dedicated to developing regional business interests. The company’s London office has facilitated Active Re’s global expansion and geographic diversification, establishing a market presence in Europe, the Middle East and Africa (MENA), and Asia Pacific (APAC). Active Re now operates in more than 30 countries around the world, providing financial institutions with specialized reinsurance products covering credit fraud, card theft, credit life, and surety bonds, among other short-term non-catastrophe risks. In 2017, Active Re wrote net premiums comprising 72 percent surety, 20 percent affinity, and 7 percent property and casualty. The company’s paid capital has increased by an average of more than 50 percent annually during the last decade. The company received from A.M. Best a rating of A- FSR (Financial Strength Rating) and a- Long-Term ICR (Long-Term Issuer Credit Rating), indicating the industry’s assessment of Active Re’s “Excellent”, with stable outlook. 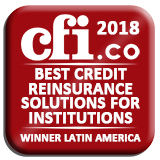 In recognition of its strong performance in risk-adjusted capitalization, the CFI.co judging panel is pleased to present Active Capital Reinsurance, Ltd. with the 2018 award: Best Credit Reinsurance Solutions for Institutions (Latin America).